The film's most famous scene is the one in which Frankenstein befriends a young girl named Maria at a lake's edge, and mistakenly throws her into the water (and drowns her) along with other flowers. Life Without a Soul (1915), d. Joseph W. Smiley, the first feature-length Frankenstein adaptation, a lost silent film, Ocean Film Corp. Originally, the famed Dracula actor Bela Lugosi was cast as the Monster, and French director Robert Florey was assigned to direct. But after various screen tests, Lugosi refused the part, and Universal chose Britisher James Whale to direct. Significantly, this film then launched the career of unknown actor Boris Karloff, who is surprisingly uncredited in the opening credits of the film as the Monster. In the beginning credits titled "The Players," the Monster is listed fourth, with a question mark after its name. 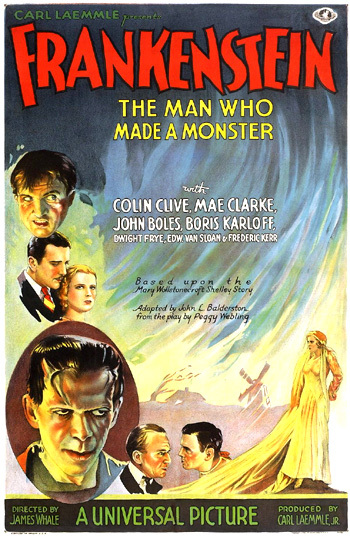 In the end credits, however, where the cast list is prefaced by - "a good cast is worth repeating...," the Monster is listed fourth with BORIS KARLOFF's name following. Karloff's performance is remarkable - his acting communicated a hint of the pitiful humanity of the grotesque Monster behind its hideous, stitched and bolted-together body. How do you do? Mr. Carl Laemmle [the producer] feels it would be a little unkind to present this picture without just a word of friendly warning. We are about to unfold the story of Frankenstein, a man of science who sought to create a man after his own image without reckoning upon God. It is one of the strangest tales ever told. It deals with the two great mysteries of creation - life and death. I think it will thrill you. It may shock you. It might even - horrify you. So if any of you feel that you do not care to subject your nerves to such a strain, now's your chance to - uh, well, we warned you. The credits play with an eerie set of rotating eyes as a backdrop. The film then opens with a close-up of a pair of hands hauling up a rope. As dusk approaches, the camera pans across a group of weeping and wailing mourners and priests during a funeral service around a gravesite, in front of a statue of a skeletal Grim Reaper. The memorable, expressionistic grave-robbing scene occurs near the Bavarian mountain village of Goldstadt. [The village was constructed for the previous year's film All Quiet on the Western Front (1930).] Beneath the gloomy sky, a coffin is being lowered into a grave. Crouched in the background from behind the cemetery fence, brilliant medical scientist (but slightly insane and overwrought) Dr. Henry Frankenstein (Colin Clive) and his dwarfish, bumbling, hunchbacked assistant Fritz (Dwight Frye) eagerly watch the proceedings. The first few clodfuls of dirt that hit the top of the casket make a dull clump/thud [an impressive effect for early talkie audiences]. They are there to steal the newly-buried fresh male corpse for an experiment that Frankenstein is conducting on the secrets of life. After the cemetery is vacated and the grave is filled in by a grave digger, they creep in and strip off their jackets, carelessly tossing them into the dirt behind them. The two dig up the fresh grave after the grave-digger has left. To symbolize Henry's sacrilegious lack of respect for the subject of death - an example of black humor, one shovelful of his dirt is irreverently thrown directly into the face of a nearby statue of the Grim Reaper! After completing the digging, they stand the coffin on end. Frankenstein pats the coffin with his ear close to it, murmuring that there will be a resurrection: "He's just resting - waiting for a new life to come." They haul the heavy coffin back with them on a cart as the moon rises. The film is enhanced by dark and forbidding Transylvanian settings. On the way up a jagged, rocky slope, Fritz reluctantly climbs up a post and cuts down an executed criminal hanging from a gallows' rope. Struggling, he crawls along the crossbar with a knife between his teeth. Frankenstein hopes to use the victim's brain in his experimental attempt to assemble a new human life form, but the body falls to the ground. "The neck's broken; the brain is useless. We must find another brain," laments Frankenstein - not surprising since the man was the victim of a hanging. Needing only a brain, Dr. Frankenstein sends his dwarfish assistant to his old, nearby medical school (Goldstadt Medical College) to steal one. [Frankenstein left the school when his demands for experiments with humans were not approved.] Fritz peers through the windows of the College, where medical students in an operating amphitheatre watch a dissection demonstration on a corpse of a psychopath "whose life was one of brutality, of violence, and murder." College Professor Waldman (Edward van Sloan), in front of floodlights, teaches about the differences between a normal brain ("one of the most perfect specimens of the human brain") and the degenerate murderer's brain ("the abnormal brain of the typical criminal"). The Professor delineates the degenerative characteristics of the criminal brain - "the scarcity of convolutions on the frontal lobe...and the distinct degeneration of the middle frontal lobe." After the class concludes and the students are dismissed, a window at the back of the amphitheatre opens - Fritz stumbles in and down to the front where he finds the two jars of brains on display in the room. One of the brains is normal, labeled "Cerebrum - Normal Brain." He grabs its glass jar and begins to rush out of the dissecting room, but inadvertently drops it when startled by the loud sound of a gong. In order not to disappoint Dr. Frankenstein, however, the dim-witted Fritz desperately grabs the other glass jar labeled "Dysfunctio Cerebri - Abnormal Brain." You must have faith in me, Elizabeth. Wait, my work must come first, even before you. At night the winds howl in the mountains. There is no one here. Prying eyes can't peer into my secret...I am living in an abandoned old watchtower close to the town of Goldstadt. Only my assistant is here to help me with my experiments. The very day we announced our engagement, he told me of his experiments. He said he was on the verge of a discovery so terrific that he doubted his own sanity. There was a strange look in his eyes, some mystery. His words carried me right away. Of course I've never doubted him but still I worry. I can't help it. Victor: Perhaps he can tell me more about all this. Elizabeth: (she turns away) Victor. Waldman: (leaning forward ominously) You do not quite get what I mean. Herr Frankenstein was interested only in human life - first to destroy it, then recreate it. There you have his mad dream. Waldman is not up-to-date on Henry's morbid research and crazy experiments and how he was grave-digging for already-dead corpses. Elizabeth begs that Dr. Waldman join them to visit Henry's lab in the watchtower where the mad experiments are taking place, and he reluctantly agrees.